Over the course of the last 5 months I developped an application to visualize Gerber data. The goal was primarily to review Gerber files before sending them to a PCB fabrication house. It is very similar to the Mayhew Labs online Gerber viewer, except it’s offline (and has a few different features). 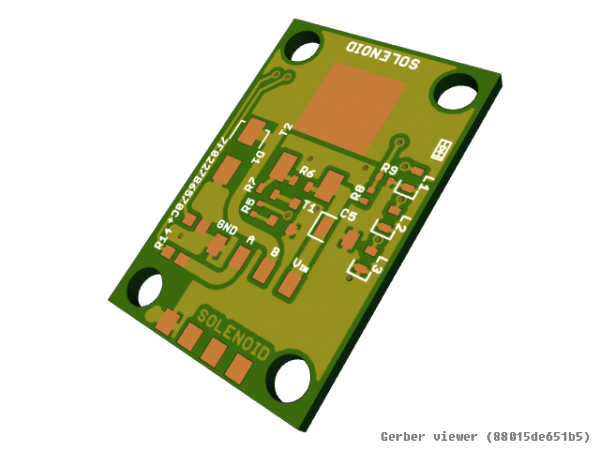 This entry was posted on Monday, August 5th, 2013 at 11:18 am	and is filed under 3D Model, PCBs, tools. You can follow any responses to this entry through the RSS 2.0 feed. You can skip to the end and leave a response. Pinging is currently not allowed. Excellent tool, and it’s in lua for added awesomeness! I think I will use it very often! It’s so simple and it’s don’t working with Gerber files, what generated with Altium Designer. Regarding your problem with Altium Designer files, can you be more specific? Can you send me example files that are not displayed as intended? Readers of this post should note, there are newer versions available on the grbv download page as of my 6 Aug 2013 post date. Too bad it won’t run in Windows XP. sorry for long reaply delay. i try grbv-20130805T1714-64bits.zip and it’s still similar result (screen shot is included). @Andrew: I modified the tool so that it loads your data files. The Excellon files especially are very different from the one generated by Eagle, so there may still be some glitches. Also I added the .GM1 extension as the list of files considered for milling, and I slightly modified the board outline detection algorithm (when there is no outline in the files themselves) so that your board looks nice. You can download the new version on the grbv website, the version tag should be at least 20130807T1457. Thanks! It’s really work with that PCB! @Andrew: The first board actually is OK on my computer. I think you can get it right by deleting the cache folder in the viewer directory. For the other board, I did fix the error here, but the board doesn’t look right, I have to investigate more. @Doub: Yep, problem with mask is gone. Thank you! As you say – it just need to delete cache folder. On larger board: Gerber Viewer load some layers (for example: PCB.GBL, PCB.TXT, PCB.GBS) one by one, but when try load other (for example: PCB.GTS, PCB.GTO, PCB.GTL) Gerber Viewer gives that error. @Andrew: The newer version tagged 20130808T1529 should fix all problems with your larger board. If not can you report it on the forum? It’s more convenient than in the blog comments to keep track of problems. Only Vista and later? Considering XP is still the most used OS still, this might be limiting. Yes, and can it give me a backrub too while doing my homework? Yes, I realize that, and I’d be happy to help programmers port the software to platforms I cannot develop for. But this is too time consuming to do it all by myself. I think that’s probably based on Sales figures and with the huge amount of pirated copies of XP, I’d say it would still be well in front – certainly is from my dealings with peoples computers, though obviously that’s purely my observations, I could be way off. My initial comment was based on figures quoted by a respected authority I read not too long ago, though I don’t think I could provide a link now. I do recall one of the big websites (perhaps google?) doing stats on the various visitors OS’s. My point was more that there are a huge amount of XP users out there (me included), so it’s a pity it’s not usable on XP, but nonetheless, it’s very good of the author to share his work with us. Actually, Wiki supports your figures too, so I’ll concede that you are correct there, though I reckon it would be interesting to know how many are really out there. How many of us have that ‘other’ machine we use for playing around with, for certain specialised things, keep under the desk for old stuff, or have a dual boot, etc.